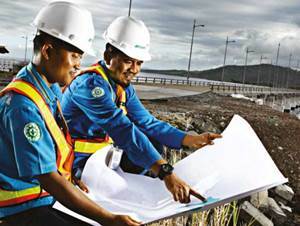 PT Aneka Tambang (Persero) Tbk - ANTAM or referred to as "PT ANTAM (Persero) Tbk" is a trusted and reliable state-owned company in Indonesia, running business in the field of integrated industry. Based in Jakarta, ANTAM has principal business in gold, silver, nickel, coal, alumina, and precious metals processing. ANTAM also engaged in refinery services. ANTAM is listed on the Indonesia Stock Exchange (IDX:ANTM) and the Australia Stock Exchange (ASX:ATM). PT ANTAM (Persero) Tbk is majority owned by the Government of Indonesia. As of December 2015, PT ANTAM (Persero) Tbk is 65% owned by the Government of Indonesia and 35% by the public (35%). ANTAM now has 9 directly-owned subsidiaries, 12 indirect subsidiary companies, and 5 associates and joint venture companies. The Company's head office is located at ANTAM Building - Jl Letjen TB Simatupang No 1 Lingkar Selatan, Tanjung Barat Jakarta 12530. In term of financial performance, PT ANTAM (Persero) Tbk reported total net sales of Rp 10,531.50 billion in the full year of 2015. This reflected an increase of 10% from the same period at previous year of Rp 9,420.63 billion. The Company’s gross profit was down 75.40% at Rp 195.14 billion from Rp 793.36 billion in 2014, according to PT Aneka Tambang (Persero) Tbk Annual Report 2015 as cited by JobsCDC.com. Hold an S1 degree, majoring in Management, Industrial Engineering, Metallurgical Engineering, Mechanical Engineering, Mining Engineering, Electro Engineering, Informatics Engineering, Computer Engineering, Information System. Maximum age of 25 years old on December 2016. A spech recording video with a maximum duration of 3 minutes. The video shows the reason you follow AFGP and the general topics related to the field of science possessed. The Candidates can add visual materials / presentations / graphic animations in the video. Speech made in Bahasa Indonesia or English. Video created using a formal language that is courteous. Videos submitted become the property of PT ANTAM (Persero) Tbk. What are the ratings in the video? Excellent communication skills and confidence. The ability to convey a clear and structured material. Creativity (creating videos and convey ideas). The suitability of the material delivery of the speech to the chosen topic. Videos uploaded in the personal accounts of participants in Youtube or Google Drive with the video title "AFGP in 2016 (the title of the video material that was delivered) (name of participant) (University) (Programs)". For participants who have difficulty uploading a video, you can also send your video in the form of CD / flash and sent to the office address of PT ANTAM (Persero) Tbk. Fill out the registration form and include your video link here. The video will be uploaded on the ANTAM's Youtube channel. ANTAM will notify you by email if your video is already in the ANTAM's Youtube channel. You can promote your video to get like and view. The most like and view will get a souvenir from PT ANTAM (Persero) Tbk..
JobsCDC.com now available on android device. Download now on Google Play here. Please be aware of recruitment fraud. The entire stage of this selection process is free of charge. PT Aneka Tambang (Persero) Tbk - S1 Fresh Graduate Program ANTAM November 2016 will never ask for fees or upfront payments for any purposes during the recruitment process such as transportation and accommodation.